Brendan Waters and Jon Ruiz, both 25, met in Parkville in sixth grade. They hadn’t planned to go into business together, but it turns out they were uniquely poised to partner up. After graduating from KU with a degree in information systems technology, Waters worked at Northwestern Mutual as a financial adviser. 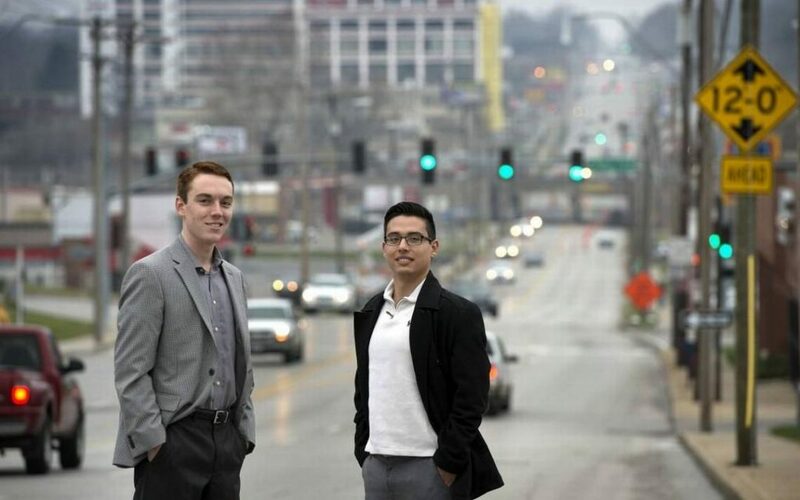 Ruiz, a graduate of the Entrepreneurship Scholars program at UMKC’s Henry W. Bloch School of Management, spent about a year working alone on a campus emergency button safety app, but he couldn’t find interested investors or potential clients. “After sharing my problems with Brendan, with his sales experience and financial knowledge and my creativity and tech expertise, we decided to start fresh and focus on enterprise-level applications,” Ruiz says. In December 2014 they founded Electronic Beacons Systems, a mobile app and software company that provides digital reports to cellphones near the beacons. The beacons could transmit all kinds of information — advertising, information for tourists or, in the case of one major client, community security information. Their work begins with the installation of Bluetooth beacons, which can be as small as four side-by-side AA batteries in strategic locations throughout the avenue. Think of the devices as tiny cell towers that can broadcast any message to someone with the right app. They have a range of one foot to more than 650 feet. “The thought is, if we were to work with all the community improvement districts … the data that we would then start generating would hopefully not only help with making data-driven decisions for one specific CID but all of them as a whole. If all the heads of the community improvement districts in the cities said: ‘You know what? Why don’t we meet quarterly and share what data we’re seeing, then maybe as an entire metro area we can really start making predictive analysis as a whole, right?’ ” Waters says. Copyright © 2018 Electronic Beacon Systems LLC. All rights reserved.